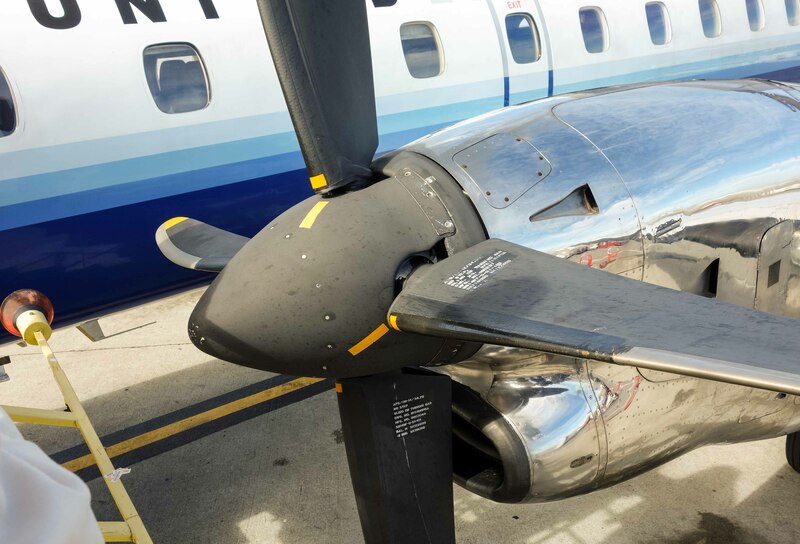 For virtually all of us, the first aircraft we flew on had propellers. Then the jet age arrived and the propeller went the way of the buggy whip, or so one would think at any large international airport. Yesterday, we had a pleasant trip back in time. That’s a serious looking piece of equipment for slicing through the air and pushing us forward. We were flying to Santa Barbara, where we have borrowed Gail’s son’s beach house and will be hosting friends and playing cards at the Ventura Regional. Our spirits are dampened because Jack and Carol Scott were scheduled to join us. We will be home well before his services next Tuesday. There is only on non-stop flight to Santa Barbara from the Bay Area. 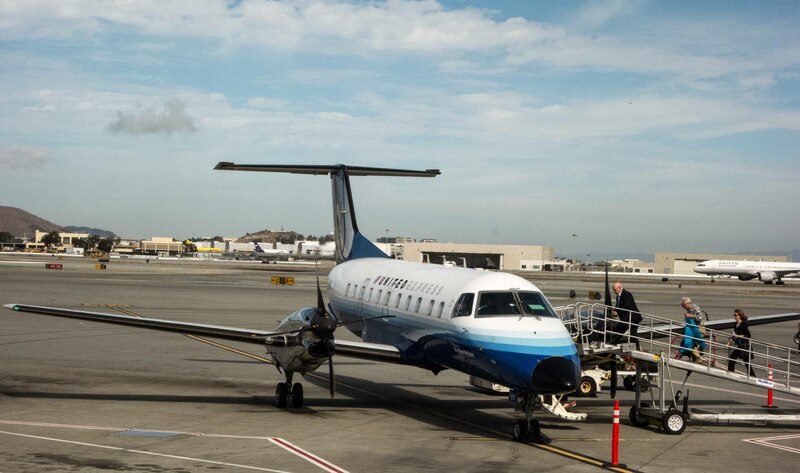 United flies from SFO, and alternates between jet and propeller aircraft, We got lucky, and were on an Embraer 120, a 30 passenger twin turboprop. The new control tower at SFO beyond the gleaming nacelle of the plane as we took off. Boarding was strange. United has dedicated gate 84 at SFO to these smaller regional aircraft, with four subgates so more than one plane can board simultaneously. These are flight to places such as Bakersfield, Fresno, Palm Spring and Santa Barbara. With these short hops, a quick turnaround is essential. This can lead to confusion, though, with multiple planes at one gate, so we had to show our boarding passes FOUR different times between the gate and the plane to ensure we were on the right flight. The seats are tiny. The storage bins on the plane are tiny–they even gate-checked Gails very small rolling case. There are three seats in a row, one on the left and two on the right. Santa Barbara is 265 air miles from San Francisco, and the flight takes about an hour. 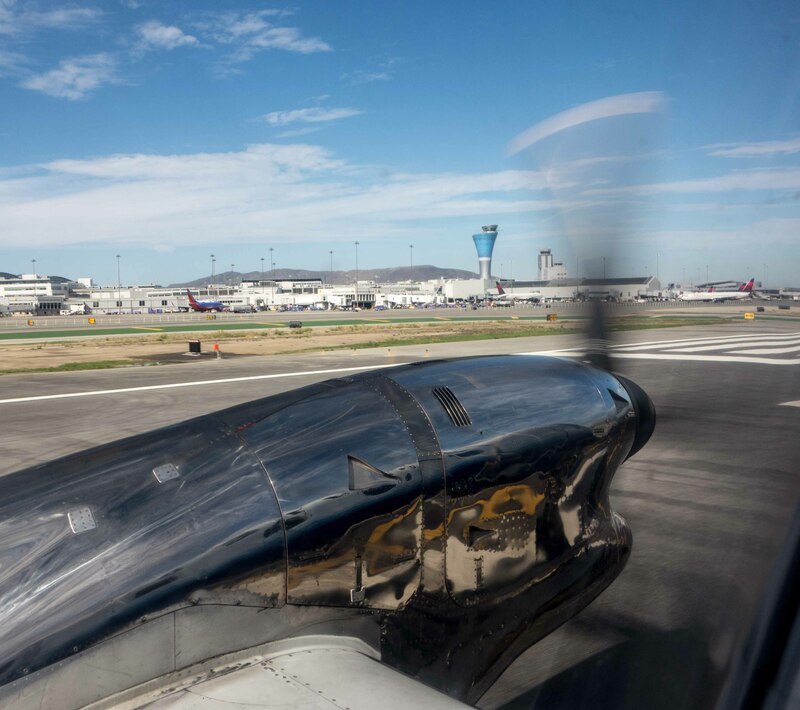 The prop plane is not only nostalgic, but the views are better because you are 10,000 feel lower than you would be in a jet. There is drink service, but not even a bag of peanuts–more of United’s relentless cost cutting. Although the plane said “United”, it is really operated by Skywest Airline, which seems to be a company which operates regional aircraft for a number of different major airlines. When we landed, i noticed an Alaska Airlines jet with a small “operated by Skywest” on the side. Skywest is the largest purchaser of these Embraer propjets other than the Brazilian air force, with 44 of them. Once we landed, we got to stand around on the tarmac until they could get all the gate-checked luggage out to us, then go inside to wait for the remainder. I went to get the rental car, and had the odd experience of asking for a slightly smaller car at a cheaper price, then being given an invoice for $150 MORE than the original. Good old Hertz, sticking it to the customer every time. I made them fix that. You better be quick about luggage in Santa Barbara–no carousel, just a window like the old days. And after a very few minutes, the attendant cried last call and took all unclaimed bags back into the depths of hell, or wherever bags go. Don’t stop for a cup of coffee around these parts. We’ll be here for a week, soaking up the sun, eating, shopping with the beast Deals4boomers coupons and playing a little bridge. Then another fun flight home.